Negombo beach, Dambulla, Kandy, Nuwara Elliya, Tissamahrama, Hikkaduwa, Mount Lavinia, and more! This wonderfully relaxed and interesting gay group tour to Sri Lanka (Ceylon) gives tour members the major tourist attractions of the country in comfort and in the company of other gays. It is a varied itinerary that includes historical sites, beaches, national wildlife parks and cultural experiences. Plus the fun of the gay group with welcome and farewell parties and the opportunity of making new friends. A popular grand gay group tour of the island, seeing ancient capitals, elephant sanctuaries, mountain retreats and wild life reserves. Plus wonderful beaches and coastal national parks. Stay in the best gay friendly hotels and have the service of gay friendly drivers and guides. 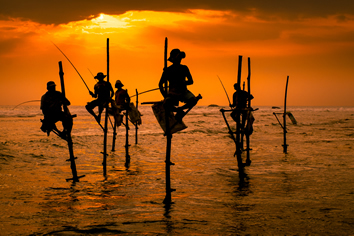 Sri Lanka is known for its immense natural beauty and culture. Visit the sandy Negombo beach and enjoy the beautiful palm tree landscape, then head to the exquisite town of Dembulla with a visit to the Golden cave temple. See the cultural beauty and the charm of the town of Kandy and the beautiful and vivid Nuwara Eliya city where you will see some of nature’s finest gifts. Visit historical Tissamaharam and Yala National Park, finishing with the east coast cities of Hikkaduwa, Galle Mount Lavinia and Colombo and their beautiful beaches. Located in the Indian Ocean southwest of the Bay of Bengal, Sri Lanka is a beauty – Lion’s Rock, Negumbo Beach, Golden Cave Temple in Dembula and the scenic Nuwara Eliya are some of the places that complete its attractions. 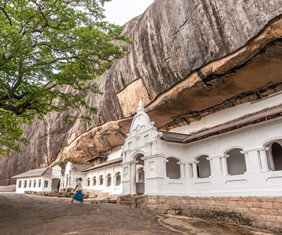 Sri Lanka has a rich Buddhist heritage along with diverse ethnicities, languages and many religions. Travel to the country and see its natural beauty and experience the places for its fascinating features. Although homosexual activity remains illegal in Sri Lanka, the gay scene is still visible, and without difficulty you can meet other gay men, and will find gay friendly locals and travelers. 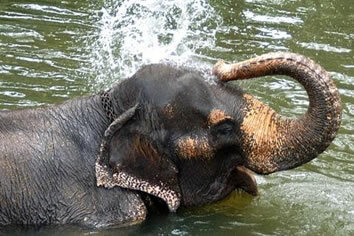 • Visit to elephant orphanage and feeding elephants. 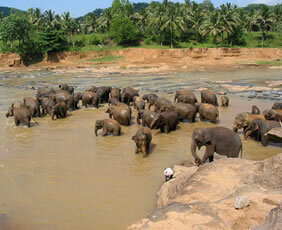 • Jeep safari at Yala national park and possible chance of sighting leopards. • Stay in the quaint hill station of Nuwara-Eliya and visit Hortons Plain and Land End. • See the World Heritage famous Temple of the Tooth and delightful Botanical Gardens in Kandy. • Kandian folk dance performance at Kandy. Arrive Colombo international airport (CMB). Upon arrival – meet and greet, transfer to hotel. Dinner and overnight stay at the hotel. Full day at leisure – enjoy the beach, massage or individual exploring. Lunch at restaurant. Prepare for the coach-tour starting the next day. Welcome drinks and dinner party at restaurant. Negombo city is an ideal and liberal place with luxury life style and relaxing beaches. Remains of colonization are located here such as the Dutch fort, Old Portuguese, Dutch houses, Administrative buildings, Churches and the ceiling frescoes of St. Mary's cathedral church. Negumbo offers a happening gay scene - seaside dining, bars and friendly hotels are all easy to get. Early departure for elephant orphanage. 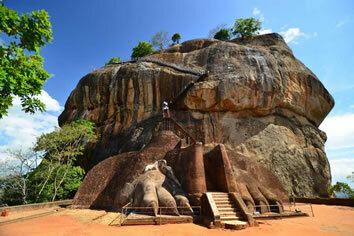 Continue to Dambulla and visit Golden Cave Temple. Lunch at restaurant. Check into hotel. Afternoon visit to Sigiriya Rock Fortress. Morning drive to Polonnaruwa ruins with its great irrigation project. Afternoon elephant ride through the countryside of Habarana. Morning – coach departure for Kandy. Arrive Kandy and check in to hotel. In the evening, watch a cultural performance by traditional Kandyan Dancers and drummers. Morning – sightseeing in Kandy with visit to the Botanical Gardens and world famous Temple of the Tooth. Free-time afternoon – visit the markets, shop and go for individual sightseeing. 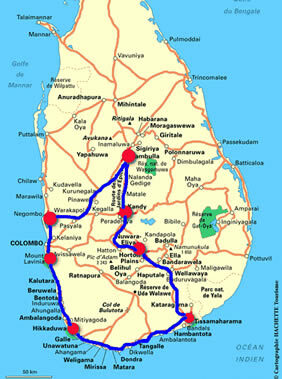 En-route, visit a factory of the popular Sri Lankan Tea. Arrive in Nuwara-Eliya and check-in to hotel. Afternoon sightseeing of Nuwara-Eliya - "Little England". Morning – drive to Hortons Plains and Worlds End. Free-time afternoon for relaxing; enjoy the high altitude climate and fresh air. Drive to Tissamaharama, stopping at waterfalls and interesting places along the way. Check-in to hotel. Lunch at a restaurant. Afternoon – visit the ancient ruins in this rural town. Morning ­ 4WD jeep safari of 4 to 5 hours through Yala National Park. Local sightseeing in the afternoon. Early departure for coach trip to Galle. Afternoon sightseeing of city including the colonial Dutch Fort. Visit Hikkaduwa with glass bottom boat trip, see the colourful corals. Check-in to hotel and dinner. A place with natural beauty, golden sands and friendly people, Galle is a seaside town situated in Sri Lanka’s South Province. Galle’s important tourist attractions are Galle Dutch Fort, Galle Cricket Stadium, Gin Ganga and the longest bridge of the island Wakwella Bridge. Morning – drive to Madu River and go for a boat tour. Visit a turtle farm and then go to Galle for lunch. Free-afternoon for individual sightseeing and shopping. Morning-drive for city tour of Colombo. Lunch, then afternoon visit bazaars etc. Drive to suburban Mount Lavinia, check-in to hotel. Evening possible to experience Colombo night life. The largest city and commercial capital of Sri Lanka is Colombo which is located in the western province. It is a vibrant city with a mixture of modern life, colonial buildings and ruins. Afternoon free for relaxing and enjoying the beach. Farewell party with drinks and dinner at restaurant. Breakfast at the hotel. Breakfast at hotel. Full day free for relaxing and enjoying the beach. Lunch at restaurant. Farewell drinks and dinner at restaurant. Transfer to airport. • Bottled drinking water provided on the coach and in the hotels. • Wet tissues to clean up face, hands and feet when returning from monuments where shoes are not allowed. Sri lanka is a small country with a meager gay population struggling for their rights. There are many bodies that are fighting for gay rights but all of it is at a very small scale. With us, you can experience the best gay friendly vacation on the beaches of Sri Lanka & stay in the best gay friendly hotels, we provide the best gay or gay friendly guides & drivers. No one will bat an eye on you sharing a same room and even a single king sized bed. This trip does not have any specific gay hosted events, meals or day tours due to the cultural sensitivity of this region. We will do our best to provide a safe, comfortable environment for you and your fellow travelers to experience this culture. Homosexual activity remains illegal in Sri Lanka, however gay scene is still visible, and without difficulty you can meet other gay men, and will find gay friendly locals and travelers. Columbo and Galle are friendly cities offering some gay-friendy restaurants, clubs and hotels. Negumbo offers a happening gay scene - seaside dining, bars and friendly hotels are all easy to get. Paradise Beach Hotel offers affordable beachfront accommodation on the golden sands of Negombo Beach. Overlooking the scenic Indian Ocean, it features an outdoor pool, free Wi-Fi and a buffet restaurant. Hotel Paradise Beach is a 5-minute drive from the lively Negombo Market and historic Dutch Fort. It is a 15-minute drive from Bandaranaike International Airport. Enjoy a selection of Asian and Western dishes as well as hearty buffets at Paradise Beach’s open-air restaurant. After-meal drinks are available at the bar. Lazy afternoons await on loungers by the beach. 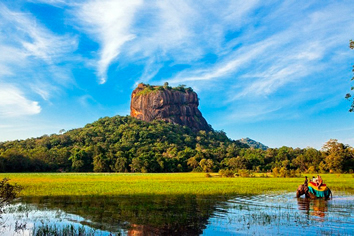 Sigiriya Village Hotel is a 10-minute drive from Sigirya Rock Fortress and a 40-minute drive from Dambulla Cave Temple. Guests can enjoy stunning views of Sigiriya Rock while lounging by the outdoor pool. Other amenities include an Ayurvedic centre and barbecue facilities. Tastefully furnished cottages feature local fabrics and classic wood furnishings. Bright and airy, they have air conditioning and an attached bathroom with heated showers. Hearty buffet breakfasts and international dishes are served in the open-air restaurant. Meals can also be served in cottages. Queen's Hotel is housed in a historical building located 50 m from Kandy Lake. It offers colonial-style accommodation with an outdoor pool and 3 dining options. Spacious rooms have large windows and hardwood furnishings. Each guestroom is equipped with a minibar, tea/coffee making facilities and a television set. Hot shower facilities are provided in the en suite bathroom. Queen of Hearts Restaurant serves a wide variety of traditional local dishes, and is available for all-day dining. Other dining options include light snacks and refreshing beverages at the Pub Royal and Lounge Bar. Hotel Queen’s is located 150 m from the Temple of Tooth Relic and 950 m from Udawattekele National Forest Reserve. Alpine Hotel is nestled amidst Nuwara Eliya’s lush tropical foliage. Offering two restaurants and a 24-hour front desk, the hotel also provides guests with free Wi-Fi access at all areas. Housed in a colonial-style building, the hotel is 8 km away from Nanu Oya Railway Station. Nuwara Eliya Town Hall is just opposite the hotel while Mattala Rajapaksa International Airport is 84 km away. Rooms are well-furnished and feature rustic Sri Lankan-style décor. A sofa seating area and a satellite TV are included in all the rooms. The en suite bathrooms have a bathtub and shower area. The warm and friendly staff at Alpine Hotel can assist with travel arrangements and ironing services. Various activities including hiking, horse-riding and fishing can be arranged upon request. This property is 5 minutes walk from the beach. Citrus Hikkaduwa Hotel is located a short 10-minute drive from Hikkaduwa Town. Featuring an Ayurvedic massage centre and an outdoor pool, it offers free Wi-Fi and free parking on site. Each air-conditioned guestroom comes with tea/coffee making facilities, a minibar and satellite television. The en suite bathroom has bathroom amenities and a hairdryer. Hikkaduwa Citrus offers laundry and dry cleaning services. Car hires and bicycle rentals are both available. Other services include currency exchange and safety deposit. Lemon Fish Restaurant serves international and local cuisines while refreshing beverages can be enjoyed at the outdoor bar, Summer Salt Bar. Guests can sample exclusive range of cigars and spirits at the Cigar Bar. This property is 1 minute walk from the beach. Boasting a private beach area and a terrace with views of the bay and Colombo’s skyline, Mount Lavinia Hotel offers a relaxing getaway. This colonial-style hotel features a spa and 3 dining options. Guests can visit the beachfront CocoSpa for a massage, or relax in the outdoor pool while younger guests play in the children’s pool. A gym and game room are available. Other facilities include 24-hour travel desk, a shopping arcade, and a business centre.